is this reissue worth getting? how does it compare to the original pressing? This album is among the Top 3 essential Spiritualized albums, next to 'Lazer Guided Melodies' and 'Ladies & Gentlemen..', 'Let It Come Down' is a masterwork, and this pressing sounds of sonic brilliance! Get an original first pressing if you can find one (better than Plain Recordings reissues). Every track on this record is a gem in my opinion. Definitely recommend obtaining this album if you don't have it in your collection yet! Ignore that other guy. this album is not a clunker. 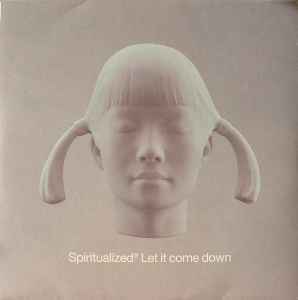 If the smell of a woman was an album, it would be Let It Come Down by Spiritualized. That is the only way that I can think to metaphorically speak of this album. Another epic soundscape production where each detail is languished over and polished through to the bone and more hugely elaborate packaging and really not much of an album underneath. I would expect nothing less at this point from Spaceman. Progressively each Spiritualised album has pulled Mr. Spaceman further adrift and closer to oblivion and Let it come down is that come down record. After the drugs, after the drinks, after the rock 'n 'roll life and floating in space. I suppose that is one reason why I personally find it the weakest. I also suppose that after three strong albums where progressively, the sound has been pushed to its logical limits and each album in its content has found new 'highs' as well as gotten darker at the same time with the lyrics; it was bound to unravel and a clunker was gonna come out. A new band, another new direction of sorts with the sounds and the lyrics. A million players and still, while it might be a deeply personal album as the titles might suggest. It's the weakest of the bunch. The Dreamhouse notion has been abandoned and the cocoon has been pierced so, let it come down.